With the week's weather forecast bringing smiles of relief to Athletic Directors across the state, Mt. Ararat was able to make up a meet cancelled in April. Given the changes in schedule not everyone on the original schedule made the meet but a couple others stepped in to make it a full meet. Messalonskee and Erskine Academy were out, but Oxford Hills and Cony joined. As scheduled, Leavitt, along with Buckfield rounded out the field. Leavitt had just met Mt. Ararat Friday in Lisbon at a meet hosted by Brunswick so a few if the races had a similar feel. The Cony Rams won the boys meet with 124 points. Mt. Ararat claimed 97 for the second spot followed by Leavitt (84), Oxford Hills 79), and Buckfield (5). 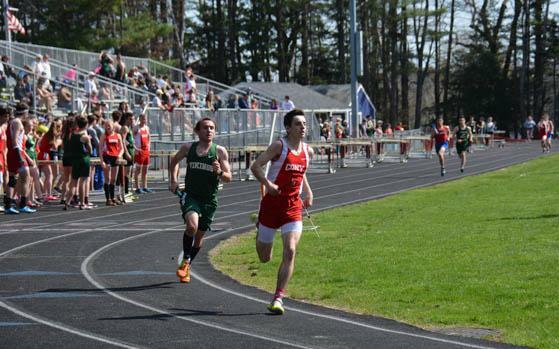 The 4 x 800 got off to a very fast start Oxford Hills Dominic Sclafani and Caleb Richardson from Cony running the first legs as if they were running a 400 with each handing the batons off in just over two minutes, but the Rams had the better of the later legs as Cony claimed the top spot at 9:05.38 with Mt. Ararat second. Oxford hill finished a distant fourth. If the Vikings were just looking for points it may have made more sense for Sclafani to enter the open 800. 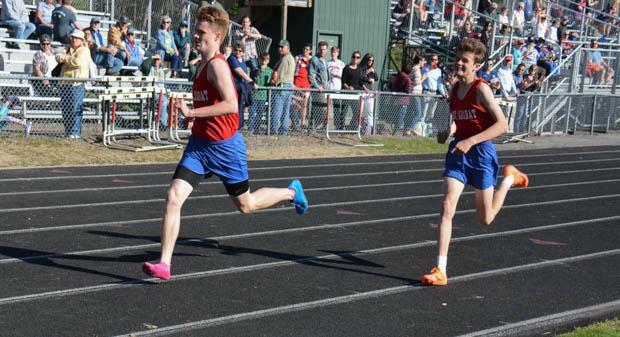 But if he was disappointed it did not show in the 1600 as Sclafani won in 4:38, with Richardson behind at 4:53. But the battle for third was neck-and-neck between Nate Cohen and Jax Hollenbach as Hollenbach had to overcome a blown tire and ran most of the gun lap with just one shoe. Bryce Pelletier of Leavitt won the 110 hurdles (18.22) while Cony's Nathan Berry took second (18.51); this pair were each pushed down a spot in the 300 meter hurdles as Max Spelke won it for Mt. Ararat at 45.23. Dawson Stevens was a triple winner for Oxford Hills. He won the 100, clocking 11.51, the 200 at 23. 71, and threw the javelin 166-2 to win. Stevens is the 2017 State and KVAC champion in the javelin. Stevens was followed by Jason Halliday of Mt. Ararat in the 100 while Caleb Bowen of Leavitt took third. Cony's James Olivier claimed second in the 200 while Mt. Ararat's Tyler Bernier was third. Cony went 1-2-3 in the 400 as James Olivier (52.51) was followed by Travis Nickerson, and Alex Cousins. 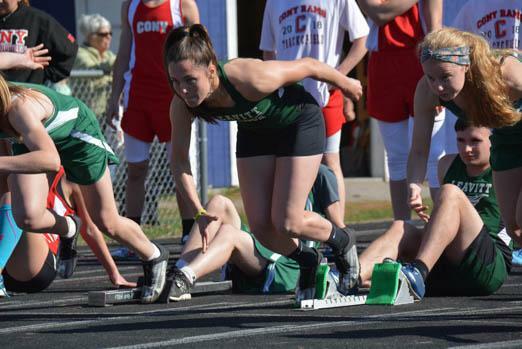 The Rams' dominance in the 400 combined with taking 2-3-4 in the 800 and long jump, along with positions 3-4-5 in the triple provided Cony the points need to get over the top. But Mt Ararat's Tyler Bernier collected the win in the 800 (2:08.39), with Caleb Richardson just 0,09 seconds behind; Richardson was followed by two other Rams. Elijah Dutil easy won the high jump clearing 6-0. Dutil also took second in long jump but Mt. Ararat's Ethan Rac jumped 18-11 to record the longest jump of the day. Dutil wrapped the day with a third place in the triple jump but a pair of Hornets from Leavitt grabbed the top spots. Caleb Bowen went 42-02.5 for the win while Stephen Gray was the runner up. Gray also took second in the high jump. Dawson Stevens winning javelin throw of 166-02 for the Vikings topped Mt. Ararat's Max Spelke. The Discus was won by Cony's Nathan Berry, while Caden Pond of Mt. Ararat threw the shot put 38-10.5 for the win. On the girls side the distance runners sustained the Eagles as Mt. Ararat won the 4 x 800 relay and led by senior Katherine Leckbee took the top three spots in both the 800 and 1600. Leckbee also claimed the win in the 3200. Mt. Ararat ended with 111.5 points followed by the Vikings of Oxford Hills at 104. Cony (95), Leavitt (83.5), and Buckfield (2) rounded out the scoring. Leavitt's Nicole Daigle, who currently owns the KVAC title in the 200 finished second on this day, but Daigle held on to the top spot in the 100 with a run of 13.08. Daigle was the favorite, coming in as the reigning KVAC Champion in both the 100 and 200; she is also the State Class B title holder in the 100. After winning it all last June she followed the title performance with a personal best 12.54 in the 2017 New England Championships. Taylor Haggerty of Oxford Hills took second in the 100 with a time of 13.26. The girls 1600 went 1-2-3 for Mt. Ararat's Katherine Leckbee, Karli Leighton and Anna Harbo; the same trio took the 800 in the same order with Leckbee clocking in at 2:37.66 for the win. Leckbee had a third win in the 3200 but did this without company, as Oxford Hill's Emily Corbett took the second spot. Sara York clocked 1:03.02 in the 400 to win for the Eagles with Cony's Julia Reny second. Julia Reny also claimed third in 100. 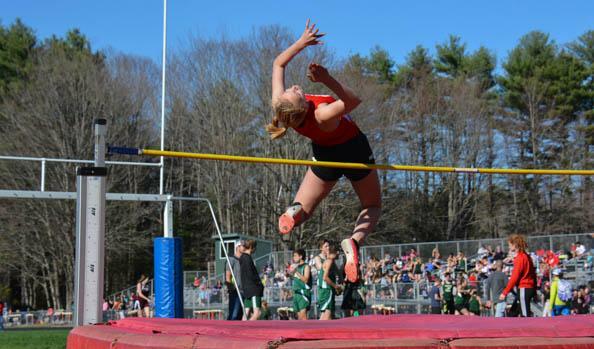 Cony's Tess Towle, another first year performer for the Rams, won the girls high jump, with a personal best of 4-10. Leavitt's Keragan Davis, and Mt. Ararat's Cassandra Kane split second at 4-08. Towle also placed 2nd in the triple while conceding the top spot to Alexandra Ryan of Leavitt 31-03.5. Another Towle, Annemarie, won the 1600 race-walk for Cony. The long jump went to Oxford Hill's Taylor Haggerty with a jump of 15-10. 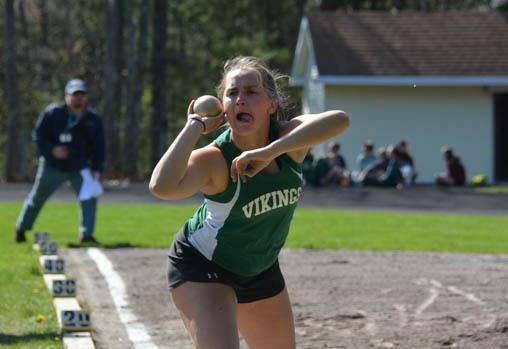 As expected Oxford Hills dominated the throws as Jadah Adams won the Javelin (117-11), Megan Bickford took the Discus (88-09), and Maighread Laliberte claimed the shot put (33-10), but the Vikings girls showed great depth as they took the top three spots in the discus, and the top two in the javelin and placed well otherwise taking ten of fifteen places overall.